This is such a great little edible goodie that you can make for Easter: parties, kids school functions, bake sale etc. Clean, dry and spray the inside of plastic eggs. Push mixture into top and bottom and then squeeze together by adding an small amount of mixture to one side and then squeeze the two halves together. Open up and as you do so move each side in a different direction to “unscrew” your new creation. Melt candy melt or chocolate – add food dye to desired color – dip eggs into the mixture and then sprinkle with candy confetti, sprinkles, etc. 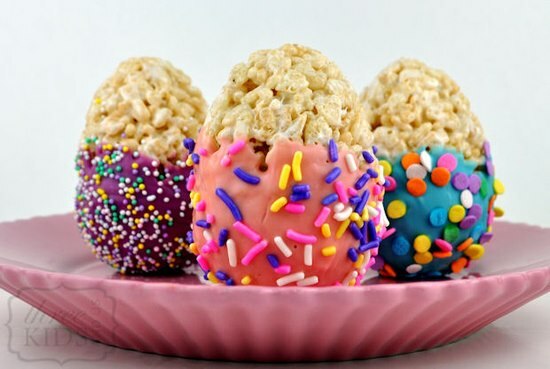 This entry was posted in Crafts ~ DIY ~ Projects, ~Easter, ~Edible and tagged butter, candy, Cereal, chocolate, coating, Color, coloring, confetti, cook, desert, easter, fun, Marshmallow, rice krispie, Rice Krispie Treats, sprinkles, ~Food, ~Home, ~Party. Bookmark the permalink.